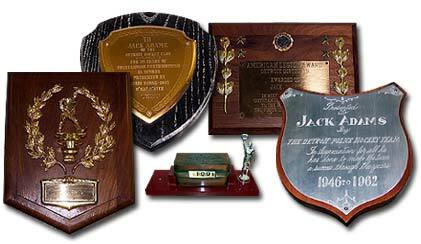 A selection of plaques and gifts awarded to Jack Adams for his outstanding contributions to hockey from a variety of presenters. 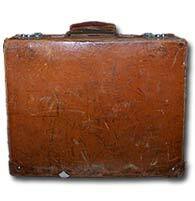 From left to right: 1951-52 Flints Ice Skating & Youth Hockey Program; Louis Stone - 1947 B'NAI B'RITH; Detroit Times Downtown Quarterback Club - 1952; American Legion - Detroit Districts; and the Detroit Police Hockey Team - 1952. 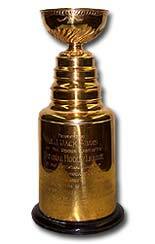 This Mini Stanley Cup was presented by member NHL clubs at the Testimonial Dinner of Friends & Associations on November 27th 1962, assembled to honour Adams' half a century of outstanding services to the game of hockey as a player, coach, manager and league governor. 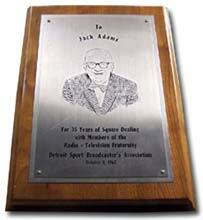 A plaque awarded to Jack on October 8, 1962 - "For 35 years of Square Dealing with members of the Radio - Television Fraternity Detroit Sports Broadcaster's Association". 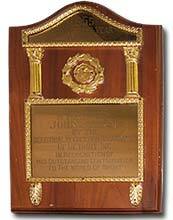 The plaque commemorating Jack's election to the Michigan Sports Hall of Fame in 1957-58. 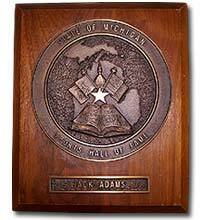 Adams received this 1955 "Man of the Year Award" from the Industrial Recreation Association of Detroit Inc. in recognition of his outstanding contribution to the world of sport. 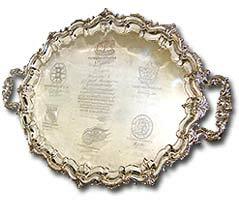 The NHL presented Adams with this sterling silver tray to commemorate his 25th anniversary as General Manager of the Detroit Red Wings. 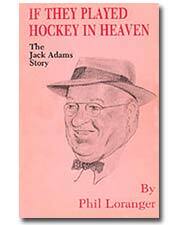 IF THEY PLAYED HOCKEY IN HEAVEN, The Jack Adams Story was written by Philip J. Loranger and published in 1976.